You have plain text email creation in Gmail down, but what about sending out visually engaging email newsletters? Yes, it’s now possible to send Gmail newsletters, but why do you need to? Read on to understand why and how we should jazz up our important professional email messages and send them as email newsletters. In 2004, Gmail burst onto the scene with mass adoption. Users of Hotmail fled to use Gmail’s clean and smart email interface. Fast forward 13 years and Gmail is still one of the most widely used email platforms in the world. Impressively, it’s a platform that helps 1 billion users every single day send and receive emails. Gmail is one of the most popular email clients with a market share of around 20%. Gmail is a great platform for sending and receiving basic text messages. Over the years, clever marketers and large businesses have leaned on third party email platforms like MailChimp, Active Campaign, Campaign Monitor, etc. to send out visually impressive email newsletters. In fact, 82% of B2B marketers use newsletters for content marketing. These third party email platforms have been created with the idea to send bulk email newsletters. Most companies utilizing these platforms, require a person or team dedicated to sending out bulk emails to get the full functionality out of the platform. In the end, these email tools work great when you have a combination of money, time and resources to devote. Unfortunately, if you’re in any other profession than an email marketer, you won’t be able to rely on these third party email services to help you with your one-off, custom emails that each of us sends on a daily basis. Yep, not much has changed for us in the last 25 years. Regardless of whether you’re sending emails to your team, clients or prospects our plain text emails contain three visual elements text, hyperlinks, and attachments to grab the attention of our audiences. A call to action should be taken! 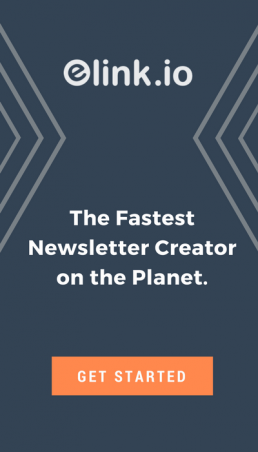 It’s time to bring the power of email newsletters to the masses. You should be empowered to create and design email newsletters in a fast, visually appealing and professional way. Newsletters in every sphere of life! Regardless of your position or industry, you send important emails to your teammates, prospective clients, customers, vendors, partners, etc. These emails contain information that needs to be read, clicked on and more often then not require a response back. We’re all getting inundated with emails. It’s never been more important for your emails to stand out from the rest so that you get the interactions and response you need to do your job. Make your emails & message stand out. Help your audience retain information. Your prospects and clients receive a lot of emails that look fairly similar and basic. All sales professionals look for ways to stand out from the crowd and look for shortcuts to save time crafting emails. Imagine, if you took nearly the same amount of time that you took to create a plain text email template and turned it into a visually appealing email newsletter that looked something like this? You’re sharing the exact same information. Instead of sharing a bunch of boring text and web links, you’ve turned them into a professional customized email to engage your customers and clients. Now you might be thinking that looks and sounds amazing, but it might be a bit complicated. The best part is the technique we’re going to show will take nearly the same amount of time as creating a plain text email template! We promise, you will not have to deal with any HTML code to create Gmail newsletter template. If you’re an influencer who has an awesome following on social media as well as on your blog/website, emails are a great way to stay in remain relevant to your audience. It’s important to be creative and find ways to engage and capture your audience’s attention. Remember, you’re number one goal as an influencer is to be perceived as relevant. Every internet user in the world has a phone number and an email address. These are the only two truly direct forms of communication. Take advantage of email addresses of your followers and start shooting off engaging emails to grow your follower base! Regardless of the size of your company and whether you have a formal R&D department or not, every company conducts research on their industry, competition, future ideas, market needs, etc. Creating a visually appealing email newsletter reflects professionalism, showcases the work you have done and most importantly creates engaging content that your team appreciates and reads. The best part is, the time it takes to create a plain text email or a Gmail newsletter is nearly the same! Whether you’re a CEO, on the executive team or a manager of a team it’s important to share your vision with your employees. Leaders need to share strategic insights, industry trends, company/team updates and reinforce organizational culture. Although words have power, unfortunately when it comes to online content nothing beats visuals when it comes to interacting with content. By taking the same message and turning it into an email newsletter it suddenly makes it look like a lot of thought and effort was put into creating it (shhh…no one has to know that it took nearly the same amount of time as a normal email). Sending out engaging email newsletters will inspire your employees, provide them with food for thought, encourage greatness and reflect the professionalism you want your employees to show to each other, partners and customers! If you’re managing an artist, you have to coordinating between event venues, management, collaborations with other artists, merchandise sales and more. Email is one of the most important ways to coordinate and keep everyone in the loop, to get things done. Imagine all of the engaging ways you can promote your artist/band. 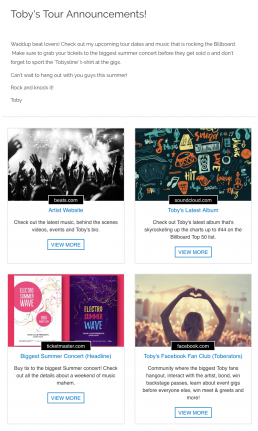 Email newsletters are a great way to standout from the crowd of emails and draw attention to your artist. The crazy part is the time it takes to create an email newsletter versus the standard boring email is nearly the same! Read on, and we’ll show you how to do it! Unfortunately, the information behind these links maybe interesting, it doesn’t engage the student and get them excited to click the links. Now if that plain text email was turned into an email newsletter that looked something like this, you can draw the attention of students to interact with your content. By creating engaging visual email newsletters, educators can grab the attention of their students. Play around with ‘click-bait’ style titles that scream for attention, and help your students study outside the classroom. Okay, so you get the point, sending Gmail newsletters is pretty darn important and can engage your audience! The use cases are endless. Mic drop. So how can you send email Gmail newsletters in minutes! 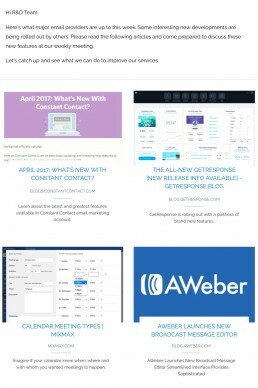 By now that your mind is probably overflowing with all kinds of ways email newsletters will change the way you communicate. Let’s jump into the ‘how’ to create and send gmail newsletters. The technique we’re about to show you will make it easy for you, so you don’t have to send HTML emails (deal with messy coding) or stress about the design of your gmail newsletter. The fastest and easiest way to send Gmail newsletters is through elink.io. Here’s a quick look at the steps you need to follow to create an email newsletter from elink.io & shoot it off from Gmail. The first step you’ll take is to select a template. There are 17 responsive email newsletter templates that are all unique and visually appealing. Choose the best Gmail newsletter template with images to share with your audience. Select one of the layouts to get started. Don’t worry; you can come back any time to update your layout. Yes, even after you have published your newsletter! Copy and paste the web link (https://…., www….) of any content around the web. 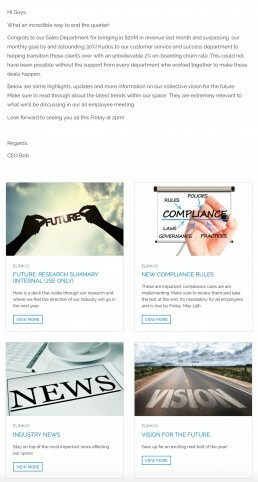 It can be articles, videos, websites, online documents, and elink.io will automatically fetch an image, a title, and a short description. From there you have the option of editing any of the information to add your voice. Take the time to create an engaging title, add an eye-catching image, and speak to your audience. Give your gmail newsletter a title that’s catchy enough to lure in your audience from the get-go! We recommend choosing the “Header 1” template to add a visual banner and short description of what the content is about. Format the text to make sure your audience does not miss out on any important information. Add your brand logo or personal profile, so everyone knows it’s coming from you. Quickly add links to your website and social media accounts so that your audience can connect with you on various other platforms. That’s it, you’ve created your email newsletter now hit publish! You’ll come to your dashboard that shows your published content. Click on the newsletter button, and from there you can integrate with your Gmail account. Shoot over your email newsletter as a draft to your Gmail account. Visuals help, but videos help tie everything together. Here’s a quick 1-minute video that shows how to create gmail newsletters in minutes! We have a feeling your mind might be racing with all the ways you can use email newsletters in your life. You’re now fully equipped to create quick, easy-peasy, professional and beautiful gmail newsletters in minutes! In the era of 8-second attention spans, it’s a necessity for all of us to engage our audiences when we share important information! At the same time, it’s incredibly important that if we’re making content engaging that we don’t have to spend a lot of time on the creation process. elink.io is the smartest way to accomplish that. Out of an average of 121 emails, we receive daily, make sure your email stands out from the rest. What are your thoughts about plain text emails versus Gmail newsletters? We would love to hear how you plan to create and send Gmail newsletters in your every day email correspondence life! PS: You can also use Active Campaign or Constant Contact instead of Gmail to send out awesome Newsletters in minutes! I really need to up my email game! Thanks for the article it was a really interesting read, I can’t wait to try out e link. I use MailChimp and admit I have no idea what I’m doing, so I might try this out. I use Gmail for everything, yet I didn’t even think of using it for newsletters. Good article! Thanks, Beth! You can use elink to create MailChimp newsletters as well as Gmail Newsletters. What an amazing tool! I also use MailChimp but much prefer gmail because of my familiarity with it. 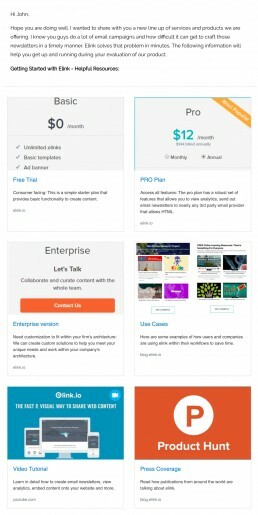 It would be great to transition my newsletters to that platform instead of MailChimp. Hi Emmi, Great hearing from you! MailChimp is great because the platform lets you send out bulk emails with awesome tracking. Gmail newsletters are great for sending smaller email batches and more personal correspondence:) The good news is elink.io is integrated with both! Such a helpful tool and appreciate all the clarity! Agree with the comment above about using MailChimp, but would love to explore other options. Thanks! I’ll start using this tool, as I am using gmail for sending emails. Need more to learn more about it. Feel free to reach out if you need any help with creating your Gmail Newsletters! I had no idea gmail could do this! Thank you for goingso in depth and even showing different examples of how to use it! You are welcome, Kaitlin! Uploading HTML email templates on Gmail is not handy at all so elink.io offers the perfect solution for you to send out Gmail newsletters. Oh wow that’s a lot of great info. I have bookmarked to keep referring back to. This is so informative! Never knew some of this stuff, thanks! Wow! Thanks for the information. Also, I loved the California Dreams reference. In all seriousness, though, I tend to be casual with email so this will give me something to think about. Great tips! I really need to get better about emailing updates. You’ve reminded me how important it is! GREAT TIPS! I learned a lot and I consider myself pretty tech savvy. Is it possible to add an “opt out” or unsubscribe” feature at the bottom of the Gmail Newsletters? I am looking to incorporate newsletters into my business, currently have everything with my business linked to Gmail and would like to stay within Gmail but would definitely want to have that feature at the bottom of all newsletters.